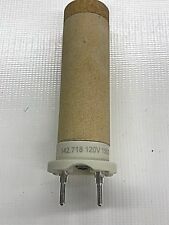 2 - 142.718 HEATING ELEMENT FOR LEISTER TRIAC ST 120V/1550W FREE SHIPPING! LEISTER TRIAC, TRIAC S, or BAK RION. 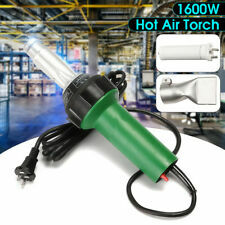 FOR 120V HOT AIR HAND WELDING TOOLS. Output: 2000W. 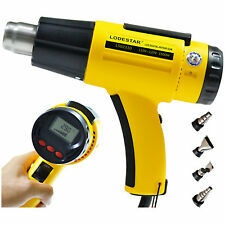 This LCD hot air gun with high performance and long service life. 4 Nozzle. You can adjust temperature from 100 to 600 degrees. The hot air gun will NOT shutdown until it cools down. It works like new and has been fully tested. The temperature range is 120 - 1100 degrees. 220V 1600W Hot Air Torch Plastic Welding Gun Weld Pistol. Heat power: 1600W. -Can weld the hot plasticity material. 1x Plastic weld tool. The scope of application. Air mass flow：max230L/min. -Carbon brush to a minimum motor stopped automatically. 220V 1600W Hot Air Torch Plastic Welding Gun Welder Pistol. Heat power: 1600W. 1x Plastic welder. -Carbon brush to a minimum motor stopped automatically. -With Electronic heating protection system. -With hot protection tube. This is aNEW-in-the-box 250 Watt 120VACWeller Heat Gun, model 6966C. It is self standing and has a 3 position switch (Hot-Off-Cold). Epoxy Curing. 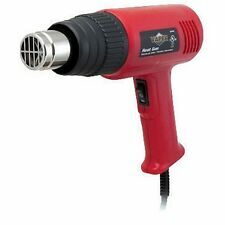 Leister Triac ST Hot Air Blower Heat Gun FREE SHIPPING! Leister Triac ST Hot Air Blower Heat Gun. Up for sale is a Well working. Brand Unbranded Brand Unbranded MPN Does Not Apply Country/Region of Manufacture China Rated Voltage 220V Rated Output Power 300W Main Color Black UPC Does Not Apply. Rated Output Power : 300W. Nozzle are compatible with 850 and 852D series, Aoyue 906, 968, 850, 6028, and many other systems. It doesn't fit to the Handheld Heat Gun whose adapter is 22 mm. 1x Heat Air gun with 4 nozzles. Verstile dual temperature settings. Low heat is approx 600F. High heat is approx 1000F. Material: Plastic and steel. Color: Blue/ Black. Plug: US Standard Plug. Great for removing the cracked screen for cellphone repairs. Nordson 815138D Hot Melt Gun Applicator 240V 260W 50/60Hz ! WOW ! Power: 1600W. Ceramic: with high temperature ceramic firing, thermal shock resistant, high strength, high temperature resistance, not easy to break, long life and other characteristics. Material: Ceramic. GDS 18V-EC 250 . Maximum power and torque of 250 Nm in forward and reverse rotation. More power: Up to max. 250 Nm in forward and reverse rotation. Torque, max. (hard screwdriving applications): 250 Nm. Power 1600W. The hot air gun welder is easy grip to hold that is very convenient for the operators when working. 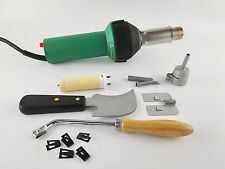 The hand held hot plastic welding gun tool is widely used for welding plastic advertising materials such as PVC Flex Banner, tarpaulins, TPO materials, etc. We have 120V and 220V IN warehouse after you buy. Welding plastic synthetic rubber, asphalt plates, tubes, profiles sealing tape, coating fabric, film, foam plastic, ceramic tiles and plastic flooring. VARIMAT V2. THIS FITS THE FOLLOWING LEISTER WELDER. 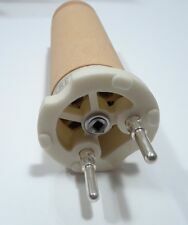 WHITE ROLLER WITH BEARING BUSING AND ROCKER COMPLETE. LEISTER LE MINI 120 VOLT / 400 WATT. LEISTER 118.887 WELDING SHOE COMPLETE (FWP-INT AIR) V-SEAM 25MM. THIS SHOE FITS THE FOLLOWING LEISTER EXTRUDERS OTHER LEISTER PARTS AND ACCESSORIES! THIS FITS THE LEISTER HOTWIND S HEATER. Heater overheat protection device. Temperature: room temperature -650 ℃. Removable air filter. Rated power: 1600W. Power cord length: 3m. THIS PUSH FIT NOZZLE FITS THE FOLLOWING LEISTER HEATERS. ROUND SIEVE NOZZLE (ø 62.5MM) ø 150MM. ADDITIONAL WEIGHT FOR LEISTER VARIMAT V AND V2 - BRAND NEW FREE SHIPPING! LEISTER VARIMAT V AND VARIMAT V2 HOT AIR WELDER. EXACT FIT AND WEIGHT. LEISTER VARIMAT V AND VARIMAT V2 HOT AIR WELDER. Heat gun in good working order. Available worldwide. LEISTER 114.044 ELECTRONIC CIRCUIT BOARD FOR ASTRO WEDGE WELDER NEW FREE SHIP!!! THIS FITS THE 230 VOLT LEISTER ASTRO WEDGE WELDER. LEISTER 114.044 ELECTRONIC CIRCUIT BOARD. BEFORE PURCHASING, BE CERTAIN THIS BOARD IS. As shown, this is a Commercial Strobe Light . It appears in good cosmetic and structural condition. Did not test bulb to check if it is working. LEISTER 140.457 - TRIAC AT - DISPLAY CIRCUIT BOARD - BRAND NEW FREE SHIPPING!!! THIS FITS THE LEISTER TRIAC AT. LEISTER 140.457. ELECTRONIC DISPLAY CIRCUIT BOARD PRINT ADAPTER 100-230V FOR BRUSHED MOTOR. BEFORE PURCHASING, BE CERTAIN THIS BOARD IS. The WELDY hot air hand tool energy HT1600 6 Heating tube protection for more security. 10 Easy-clean air filter. 8 Professional outdoor tool. 9 Suitable for all job-sites. FOR THE LEISTER BITUMAT AND THE BITUMAT B2 MODIFIED BITUMAT HOT AIR WELDER. FOR LEISTER PRODUCTS! Parts for Leister Varimat V, V2 & BAK Laron • New • Free Shipping! For Leister Varmat, Varimat V, Varimat V2. shaft and an aluminum yoke, and join the 2 together with screw that you can only tighten by driving out. Stainless Steel components ensures the longest life of parts and rust free! WELDY energy HT1600 is a compact and robust hot air hand tool for an endless range of professional applications. The WELDY hot air hand tool energy HT1600 7 Swiss technology and engineering. 6 Heating tube protection for more security. This is for a pack of 2 elements. 142.718 120V/1550W (type A) spare part Replacement for Leister these work in the new style Triac AT and the Triac ST heat guns. They replaced the old Triac S heat gun. 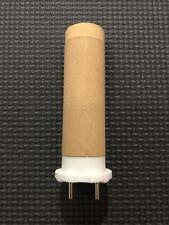 LEISTER 106.986 DRAWING NOZZLE 7MM TRIANGULAR NOZZLE FOR SCREW ON TYPE HEATER TUBES. 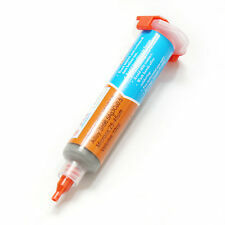 THIS NOZZLE FITS THE FOLLOWING LEISTER TOOLS WITHSCREW ON TYPE HEATER TUBES. WELDING PEN S. WELDING PEN R.
Varitemp VT-750C 3 position switch: Off/Cold/Hot Adjustable heat setting Max Temp 1000°F/538°C Hardwired 3 prong power cord Made in USA Experienced quality shipping Thanks for viewing! (Body / Manual (Korean). Note that we are out of our office on the weekends, but we will get back to you as soon as we can. United State / Canada. It is only working with plug). ※ All image shots can be different from the real product, and there may be A differences in color RENDERING, the monitor resolution, monitor brightness, and computer specifications. FOR LEISTER ELECTRON S & MISTRAL S. FOR 230V 3300 WATT HOT AIR HAND WELDING TOOLS. IHS-113.269 TYPE 32 230V/1650 1650W. Trending at C $152.30eBay determines this price through a machine-learned model of the product's sale prices within the last 90 days. 2 - 100.985 40MM SILICONE WHEELS FOR LEISTER VARIMAT, BAK LARON, FREE SHIP!! 40MM SILICONE ORANGE WHEELS. STEP 3: USING LIQUID DISH SOAP OR A SPRAY LUBRICANT (SILICONE SPRAY WORKS WELL) SPRAY OUTER SIDE OF STEEL WHEEL, THEN SPRAY THE INNER SIDE OF THE ORANGE WHEEL. EASILY REPLACE THESE WHEELS YOURSELF.